My son, Rueben, is three and has rare severe autoimmune diseases that affect his blood, liver, and lungs. When he was five months old, he was diagnosed with autoimmune hemolytic anemia, in which his immune system attacks his red blood cells. At 18 months of age, another autoimmune disease, giant cell hepatitis, developed in his liver, and when he was three he also developed lymphocytic interstitial pneumonitis, which affects his lungs. Autoimmune diseases occur when your own body’s immune system attacks your organs or body systems. There is no cure for these diseases, just a lifetime of hospital treatments. His combination of conditions is extremely rare, but has been seen in other babies before. Rueben has spent so much of his life in hospital, including some of that time in the ICU really sick. He went into full liver failure and we nearly lost him. Rueben has also had a lot of other complications along the way including sepsis and blood clots. He’s needed drains for his lungs, has had 40 blood transfusions and plasma exchange, has been on 24-hour oxygen, has had 13 operations, and has had hundreds of IV treatments. He sees specialists in Immunology, Allergy, Hematology, Gastroenterology, and Respiratory. All this and more, and yet he is only three. Rueben gets an IV treatment every four weeks called immunoglobulin. This treatment involves giving him the pooled antibodies of thousands of donors to help his immune system work better. He also gets an intravenous treatment called Retuximab that kills his B cells. Because of reactions to this treatment in the past, he now gets it in the ICU under watch by an allergy team. He is immunosuppressed from all the aggressive immunosuppressants he is on, which leaves him picking up all sorts of infections that often make him really sick. He is also on long term steroids, which have really bad side effects, including weakened bones, high blood sugars, mood swings, and weight gain. As a result of his conditions, Rueben has reduced mobility, weak bones and low energy. He has stomach problems, vomits daily, and can’t eat. Even so, he is doing the best he ever has and is enjoying as normal a life as he can. 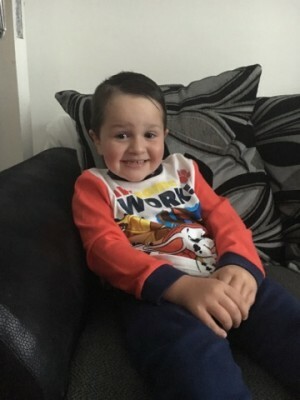 Rueben has spent weeks to months at a time in hospital going through all sorts of treatments, yet he is the happiest little boy you could meet!